HARTFORD, Conn. – Two Trinity students – Pauline H. Lake ’13 and Nina I. Limardo ’11 – were feted in Washington D.C. Wednesday, September 30, after winning first place in a competition designed to promote nutritious food choices and physical activity for children as part of First Lady Michelle Obama’s Let’s Move! initiative. In developing their smart phone app, Work it Off!, Lake and Limardo worked under the guidance of Ralph Morelli, professor of computer science and principal investigator of Trinity’s Humanitarian Free and Open Software (HFOSS) program, and Trishan de Lanerolle, HFOSS project director. The competition, called GE healthymagination, included categories for tools and games. Trinity was the winning student team in the tool category. Work it Off! is an open source tool for Android phones that demonstrates to children, in a fun and interactive way, the correlation between the calorie content of the food they eat and the calories that they burn. Using voice recognition, a child can say the name of a food, whereupon the number of calories it contains is displayed. The child can also find out what types of activities he or she can engage in to work off the calories. 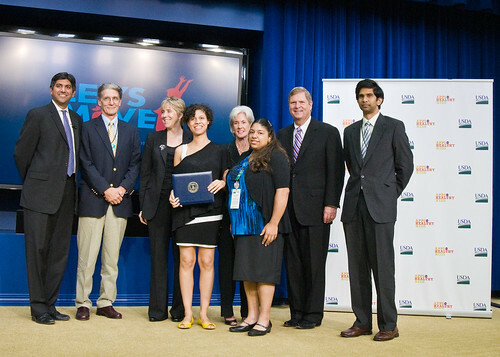 L to R, Aneesh Chopra (White House Chief Technology Officer),Ralph Morelli , Julie Goon (Director of GE's healthymagination project), Nina Limardo (Trinity College'11), Kathleen Sibelius (Secretary of the U.S. Department of Health and Human Services), Pauline Lake (Trinity College'13), Tom Vilsack (Secretary of the U.S. Department of Agriculture), Trishan de Lanerolle. The two students and their mentors journeyed to the nation’s capital for the announcement of the contest winners, whose identities were kept under wraps until the ceremony in the Eisenhower Executive Office Building. “I was really astounded,” said Limardo, a theater and dance major with a minor in music. “After the deadline passed and we didn’t hear anything, I didn’t think we won.” Limardo noted that she and Lake, working in the HFOSS Summer Intern Program, developed their app in only 10 days, while other teams took as long as two years to complete their projects. Along with the recognition that the competition bestows, the first-place team takes home $10,000, courtesy of General Electric. De Lanerolle said some of the money will be given to the students and the balance will be used to develop the product and make it available free of charge. Morelli called the Trinity students’ showing “quite a big deal” and credited both the students and the HFOSS program for making it possible. Trinity’s HFOSS project seeks to help revitalize computing education by getting students engaged in building socially beneficial open source software. HFOSS is supported by the National Science Foundation. In addition to the awards ceremony, which was attended by two Cabinet members -- Agriculture Secretary Tom Vilsack and Health and Human Services Secretary Kathleen Sebelius – as well as U.S. Chief Technology Officer Aneesh Chopra and Let’s Move! Executive Director Robin Schepper, the Trinity group was treated to a tour of the White House, a luncheon and a tour of the city. During the four months that the competition was open, 95 students, hobbyists, developers and corporations submitted eligible games and apps. Students from the University of Southern California won in the game category. Their customized Trainer game encourages players to exercise on a regular basis, thus attaining their fitness goals both in the game and in real life. Corporate recognition awards were also handed out. The judges chose the winners based on four criteria: potential to impact the target audience; potential to engage and motivate the target audience; creativity; and originality. The 14 judges included top industry experts, among them Apple Computer Co-Founder Steve Wozniak; Mike Gallagher, president and CEO of the Entertainment Software Association; and Michael J. Barber, vice president of General Electric’s healthymagination. The “Apps for Healthy Kids” competition is part of Michelle Obama’s Let’s Move! national campaign to end childhood obesity within a generation. The program itself has brought together community leaders, teachers, medical experts, parents, software developers, game designers and other innovators in a nationwide effort to get children to eat smarter and better. For a complete list of winning games and apps and links to the designs or videos and prototypes, please visit: www.AppsforHealthyKids.com.